Barbara J. Staples of Middletown died Monday, February 4, 2019 at the John Clark Retirement Center in Middletown. Born in Warren, RI, a daughter of the late Walter O. Staples, Sr. and Ruth E. (Bryden) Staples. She lived in Barrington and East Providence before moving to John Clarke Retirement Center in Middletown. She was a stock broker with the firm of Barrett & Co. in Providence until retirement in 1992. 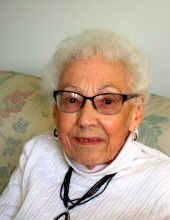 Following her retirement from Barrett & Co., she became a realtor with T. R. Little Realtor in Barrington until 1997. Barbara was included in the 1973 edition of “Who’s Who of American Women”. She was past president of Barrington Council of Republican Women, Past Treasurer of R.I. Federation of Republican Women, a member of the Barrington Republican Town Committee, member of Republican State Central Committee and a Delegate to Republican National Convention in 1988. She was a member of First Baptist Church in America, Providence, where she had served as Deacon, Chair of the Finance Committee, Moderator and member of the Pastoral Search Committee. She served as President of American Baptist Churches of Rhode Island from 1993 to 1995, member of the Board of Mission and Finance Committee of ABCORI, Treasurer of ABCORI, Treasurer of the Baptist Home in Newport. Barbara also did volunteer work at South Providence Neighborhood Ministries and Meals on Wheels. She is survived by several nieces and nephews, grand nieces and nephews and great grand nieces and nephews. She was the sister of the late Walter O. Staples, Jr. and Ruth V. Conklin. To send flowers or a remembrance gift to the family of Barbara J. Staples, please visit our Tribute Store. "Email Address" would like to share the life celebration of Barbara J. Staples. Click on the "link" to go to share a favorite memory or leave a condolence message for the family.